If you’ve never enjoyed biscuits, cornbread, pie or cake, stews or anything prepared in a camp Dutch oven, you don’t know what you’re missing. Outdoors folk have used and treasured the Dutch oven for generations because it is the one cooking vessel that can make all of the above and then some. 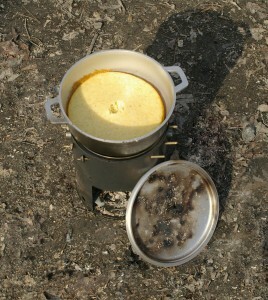 Eggs can be fried or perfect flapjacks made on the inverted lid, heated over coals. Vegetables can be steamed in it. Corn on the cob can be boiled in it. In short ~ the Dutch oven is nearly the perfect cooking utensil. I say nearly because the weight of a traditional cast iron Dutch oven makes it too heavy for all but horsepacking, Jeeping or fixed camps. As useful and popular as Dutch ovens are in fixed camps today, they were not particularly popular among the old Woodcrafters. Their extreme weight was part of the problem. Even the old-timers that liked them, only recommending them only for horsepacking or the like. Some, like Stewart Edward White, positively disliked them. Nearly all of the old books also mentioned that while Dutch ovens were very rarely used in the East, their use was more widespread in the West where undoubtedly, horsepacking was the customary mode of wilderness travel. In Kephart’s time, cast aluminum Dutch ovens weren’t available but even those of today are too heavy for tramps (hikes) and thus, are now most popular among river rafters. Back in the ‘80’s, I taught an annual class in camp cooking and Dutch oven cooking was part of the curriculum. Since that time, I’ve regularly used a Dutch oven in fixed camps. In the ‘90’s, I completed a NOLS (National Outdoor Leadership School) Instructor’s course and learned to bake in the backcountry using the Banks Fry-Bake to prepare cinnamon rolls, pizza, and even cherry pie. 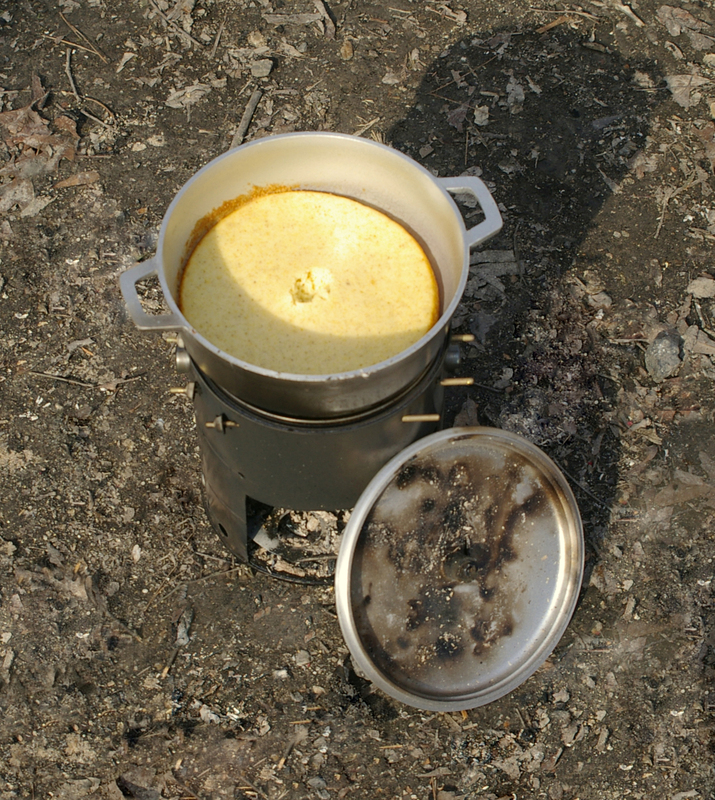 I found the Fry-Bake to be the best of the various commerical backpacking bakers but even that noble pan could not match the camp cuisine prepared in a Dutch oven. 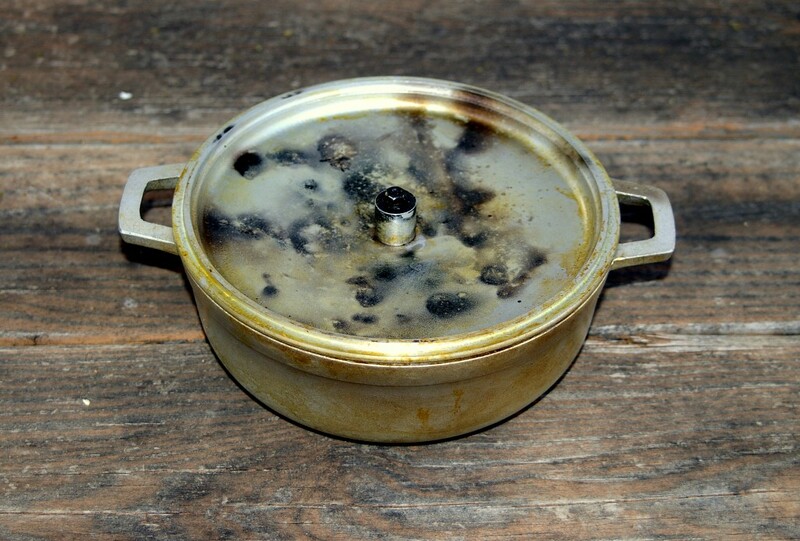 I’ve also used pie-pan “Dutch” ovens (see my post below), which work surprisingly well; but again, do not match the performance of a “real” thick-walled Dutch oven. After developing an interest in traditional camping, I renewed my search for a Dutch oven light enough to take on a solo hike. After all, if I was going to cook over a wood fire, I was going to do at least some of my cooking in a Dutch oven! My goal was to find a vessel with what I consider crucial Dutch oven features – 1) it had to be made from thick walled, cast metal (aluminum would be the only material light enough to easily carry), 2) it had a tightly fitting lid to hold in the heat and featured a depression to retain coals or briquettes for baking and 3) it had to have steep, deep sidewalls to allow baked goods to rise. In addition, the perfect vessel had to be compact for easy packing. My search led me to the IMUSA cast aluminum Caldero, that I discovered by accident during a visit to a local Hispanic grocery. 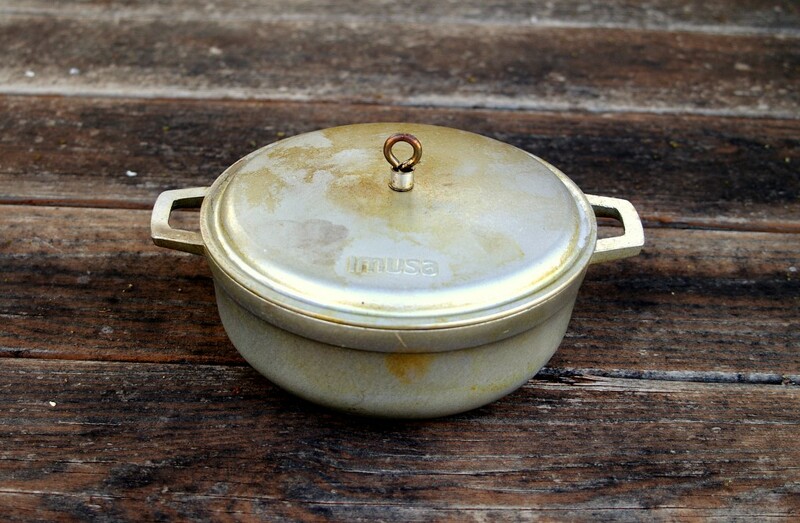 This little pot immediately struck me as the near perfect lightweight Dutch oven. In fact, if you Google “caldero”, you’ll find that a number of online “department” stores list them as a type of Dutch oven, i.e. : “calderos/Dutch ovens”. The caldero I found embodied several of the Dutch oven characteristics I’d been seeking. 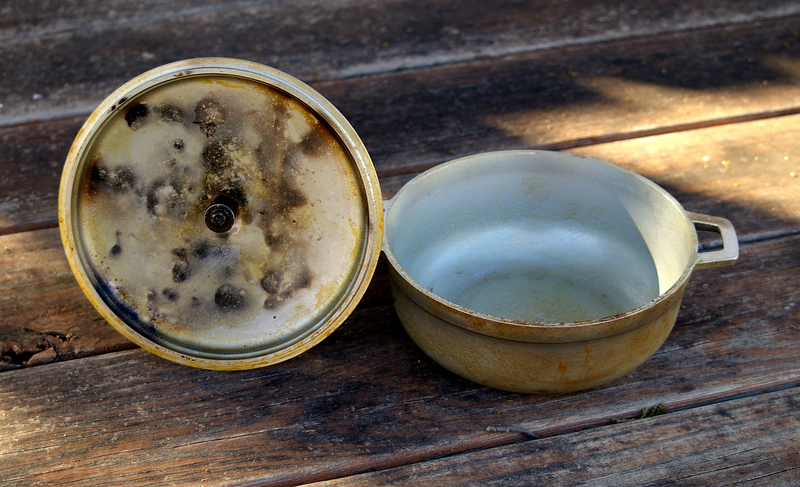 It was made of thick walled, cast aluminum, had a tight fitting lid and the sidewalls were deep and straight. However, though the lid was domed for good internal volume, it had no depression. It was also fitted with a plastic knob for lifting. I picked up the caldero and inverted the lid. The domed shape now provided a depression for baking though the fit was not tight at all. Still, at a cost of less than $12.00, it was worth experimenting with. Calderos are made in many different finishes – polished spun aluminum with riveted handles and aluminum lids, cast or spun aluminum in porcelain or other colored finishes and glass lids, cast aluminum with non-stick cooking surfaces and glass lids, cast aluminum with non-stick interior and exterior finishes and the one we are interested in, unfinished cast aluminum with cast handles and a cast aluminum lid. Calderos also come in several sizes and can be purchased individually or in combos or whole sets of sizes. The caldero I selected was the IMUSA 18-Centemeter Caldero (18 cm, 1.5 liter or 1.6 qt., 7” x 7”x 2 ¾” deep, 2 lbs.). This size is often described as a #2 caldero. The store carried an even smaller size (#0, 14 cm, 1/2 liter capacity). It now appears that IMUSA has discontinued these two small sizes and offer a 20-Cenemeter model as their smallest caldero (20 cm, 2 liter or 2 qt., 7 ¾” x 7 3/4” x 3” deep, about 2 lbs.). If you want a #2, the only brand I know of is made or imported by the Allied Metal Spinning Corporation. An internet search of caldero a couple of years ago turned up only a few specialty Hispanic online stores stocking unfinished cast aluminum calderos selling from $6.00 to $20.00. I now see that calderos are now stocked by Sears, Walmart, K-Mart, and Macy’s stores (at least online) and have become more upscale and correspondingly expensive. I suspect that this is to appeal to American tastes. 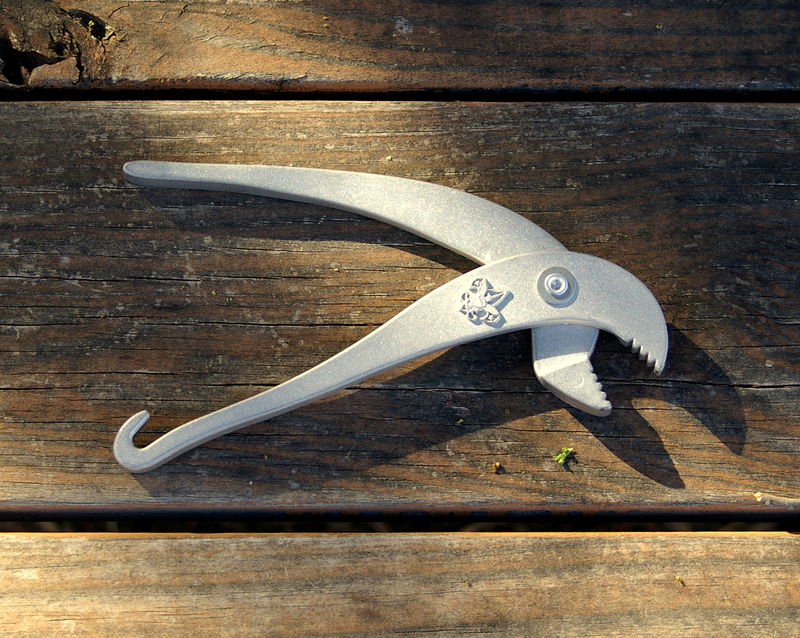 Natural cast aluminum models are less commonly stocked in favor of the newer styles described above (not useful for camping). Prices for these fancier models are also higher ($29.99 – $40.00). Of course, for the caldero to work as a Dutch oven, the plastic knob would have to be replaced, which I did, with a stainless steel eyebolt. On the underside of the lid I ran the shank of the eyebolt through a large aluminum spacer before tightening everything up with a stainless steel nut. Now when the lid is inverted, the large spacer is used to lift the lid. I carry a BSA “Hot Pot Tongs” for that job. A recent search of the Boy Scout Official store did not turn up the tongs, which have been stocked since at least the early 1950’s. Luckily, the Banks Fry-Bake company now carries their “PotGripz”, which are nearly the same. I recently had an opportunity to try out the little Dutch oven camping in the Ouachita mountains of southeastern Oklahoma. 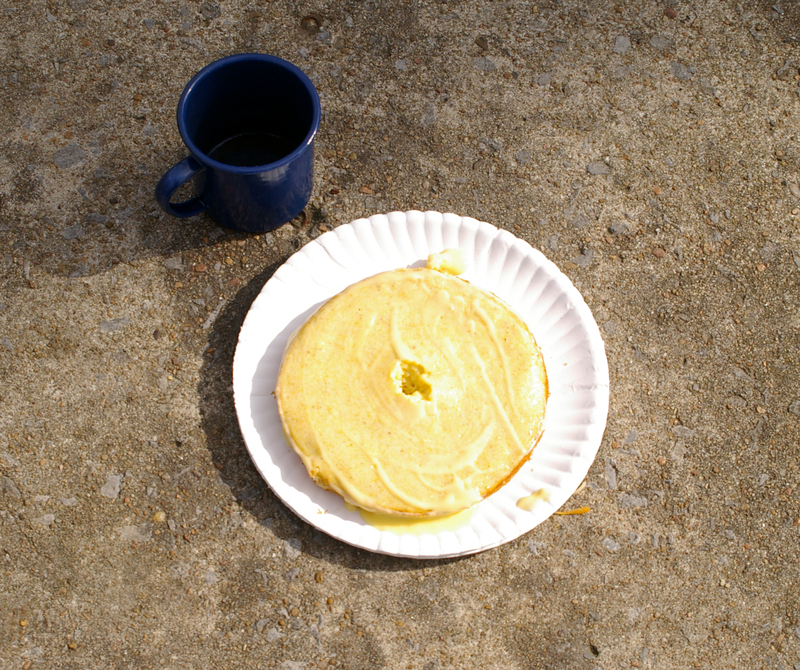 It produced perfect, golden cornbread on the first try! While I should have elevated the oven over coals like a real Dutch oven, I used my improved Nomad stove along with a “little larger than twig” fire built on the inverted lid. 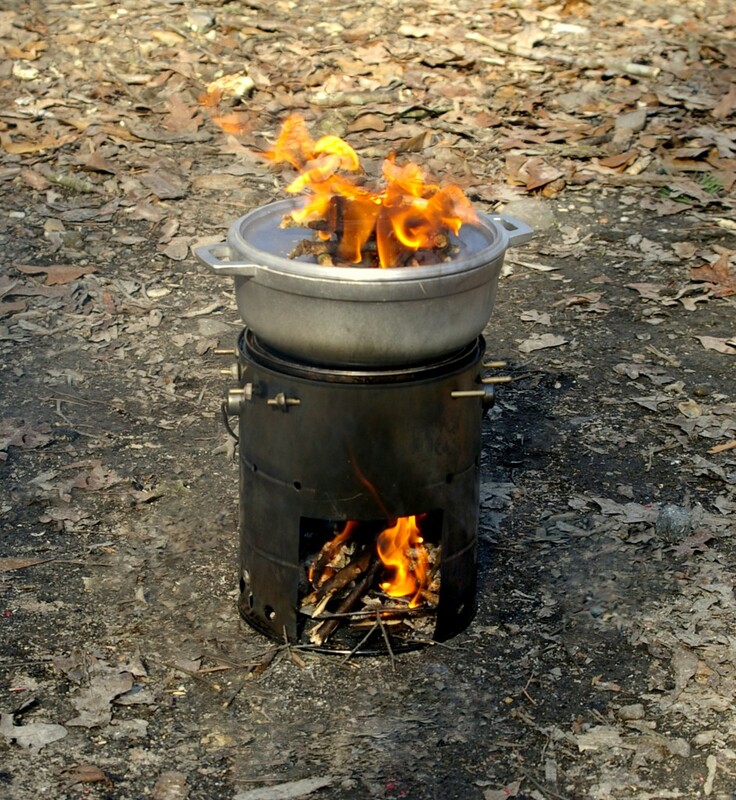 As with a pie pan oven, when using the Tramp oven over coals or briquettes, you rest bottom pan on three rocks. The coals should be centered, with the support rocks spaced around the outside. The rocks should be of equal height so the contents of the oven remain level. Dutch oven author John G. Ragsdale prefers to use three tent stakes over rocks as he believes that it is easier to level the pan, but I’ve never had any trouble finding three rocks that I couldn’t level by digging down if need be. Caldero Dutch Oven ~ Ready to Bake! At a weight of 2 pounds and a packed size of 9 3/16” x 3 ½” (with lid inverted), the little Tramp oven is light and compact. You can fry, braise, boil, or bake in it. I plan to experiment with baking a bannock in it in the near future. I can’t imagine the bannock would scorch due to the thickness of the pan. And at a cost of less than $12.00, you’d be hard pressed to find any alternative that would be as light on your wallet. Why don’t you try one of these “tramp” ovens yourself? This entry was posted on Tuesday, January 29th, 2013 at 2:38 PM	and is filed under Traditional Camp Equipment. You can follow any responses to this entry through the RSS 2.0 feed. You can leave a response, or trackback from your own site. I just got the 20cm model and I weighed it at 23.9 oz, not 2 lbs. It’s the same one made my IMUSA. That was weight with handle removed.